When I last talked about the Mooltipass offline password keeper (for which I was a beta tester) it was almost in production. Well, it's completely in production now and can be purchased! The unit has an (optional) software component as well in the form of a Chrome extension and app for management. Work on the software continues and is improving all the time. That being said, I have used the Mooltipass exclusively for managing my passwords for months now as part of my regular routine. 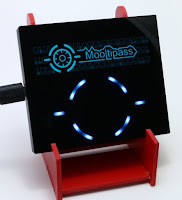 One thing you might not know about the Mooltipass is that there is also an option to allow it to boot when powered by USB but not connected to a computer (for example, plugged into a phone charger or battery bank). In this case the Mooltipass works normally but instead of "typing" anything for you, credentials are displayed on the OLED screen for you to use. The Mooltipass can still be used to let you access your credentials even if you can't plug into USB on a device for any reason. The Mooltipass can be purchased from Tindie and shipped anywhere in the world. They even accept bitcoins.